The death shortly before Christmas of Mrs Brenda Hayes, aged 89, severs one of the last links with the old Silsden Urban District Council, which ran the town throughout the 20th century until disbandment in 1974 when local government was controversially reorganised. Mrs Hayes is pictured above with her husband, Councillor Tom Hayes, during Tom's UDC chairmanship in 1969/70. Wearing their chains of office, Mr and Mrs Hayes are pictured with senior citizens prior to a day out. The picture was taken in Elliott Street, from where coach outings traditionally departed. Tom and Brenda ran the newsagents at the corner of Kirkgate and Briggate. The shop (then known as Dewhirsts and now Kirkgate News) was owned and run for many years by Brenda's father, Arthur Watson, a long-serving councillor who was chairman of the UDC in 1952-55. Brenda and Tom succeeded him at the shop and became one of Silsden's best-known couples. Tom died in 2012. This photograph was taken at a social gathering of councillors and their wives and UDC officials in 1970/71. Mrs Hayes is sixth from the left at the back, with Tom Hayes next to her. Council chairman William Cathey is pictured on the left at the front with his wife Mary. 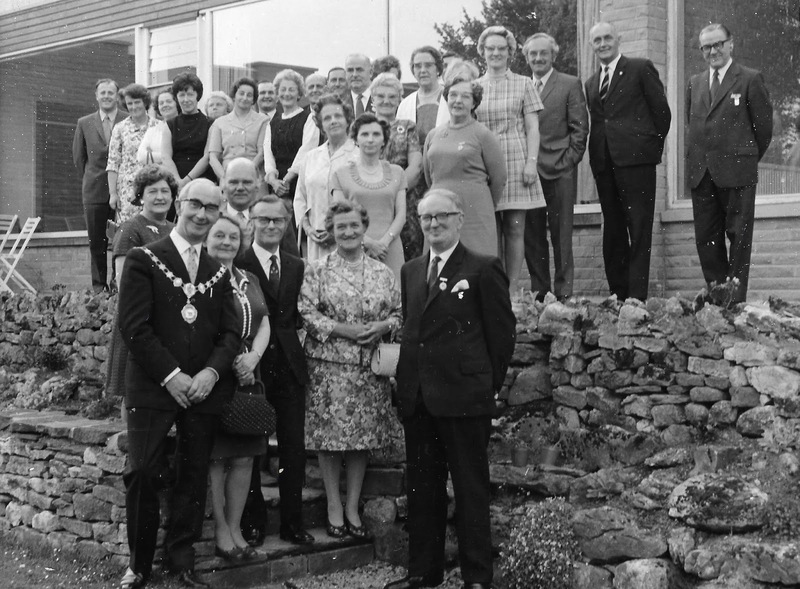 On the right at the front is Councillor J. J. Barker, chairman in 1959/62 and 1971/72; next to him is his wife Norah. Other leading councillors pictured include Nurse Catherine Herbert (chair 1963/66), Bert Mole (1966/67), Harold Kellett (1967/68), Dorothy Robinson (1972/73) and Eric Robinson, the last chairman, who served in 1973/74. Also in the photograph are councillors Brian Brockbank and Alan Townson; council clerk Eric Gration; town surveyor John Mitchell; and Roy Mason, the Keighley News and Craven Herald journalist who covered the council's doings. Silsden UDC gave way to Bradford Metropolitan District Council. Nationwide parish and town councils were created as a relatively powerless form of local government. 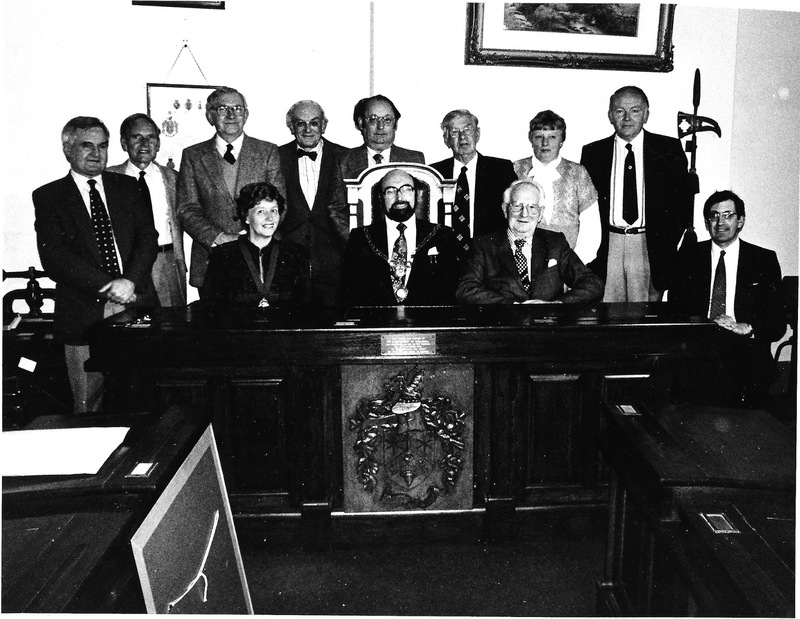 In the early years, Silsden's parish council comprised a wealth of experience as seen in this photograph by Will Baldwin. The chairman is Richard Binns. Seated next to him are Betty Crabtree and J. J. Barker. Standing left to right are Tom Hayes, John Auchinleck, not sure who this is, Eric Robinson, Neil Cathey, Ernest Hoare, Edna Egerton and John Twigg. Seated far right is the clerk Mr Hodgson.